I don’t know about you, but I’m pining for summer. We had a lovely, temperate summer here in San Diego and have been suffering through a heat wave for the past couple of weeks. Suffering, I say! Because we San Diegans cannot stand temperature fluctuations greater than +/- 3 degrees. How was summer for you? It was my first summer in my new life as an independent consultant, which meant that I got to do interesting work, but was still able to take the odd day off and spend a day at the beach with the girls. I’m loving this gig; it’s a privileged position to able to choose the work that I take on, and it helps me with setting boundaries — something I’ve never really been very good at doing. Our big trip of the summer was up to Lake Tahoe, where we had a family reunion with three generations of family from my mom’s side. My mom had 9 kids in her family, so when we have whole-family get-togethers, we usually take up a whole restaurant. This was a scaled-back gathering of the family that’s living the in the United States. A lively bunch, they are. Plenty of kayaking and boating to go around too. The best thing we did (thanks to the spectacular organization skills of my sister-in-law) was to hire a private chef — Arica from Yummy Fixins — who was soooooooo fantastic. Not only was her food spectacular, but she and her assistant cleaned the kitchen before and after! If you are in Tahoe, it would simply be wrong not to hire Arica. See those flourless chocolate cake slices in the back? I would fight you for them! The BEST I have ever tasted. My cousins and I used to spend summers together hanging out, torturing one another and generally engaging in what is most accurately described as nonsense, so it was great to have an opportunity to gather us from all the corner of the country to do this all over again, across three generations. After the reunion, we made our way back down the California coast. If I am ever a cow, please make me a Big Sur cow. They have the most amazing views. I’ll do a roundup of the coastline drive in another post, but that’s just a taster…isn’t it lovely? Ah, thanks for allowing me to relive one of the highlights of summer. And now, back to real life. The kids are back in school, we’ve got multiple Google Calendar carpools going on, and a middle school kid in the mix. Our mornings are rushed and the easiest meals are often cereal, so that’s the go-to for the kids. 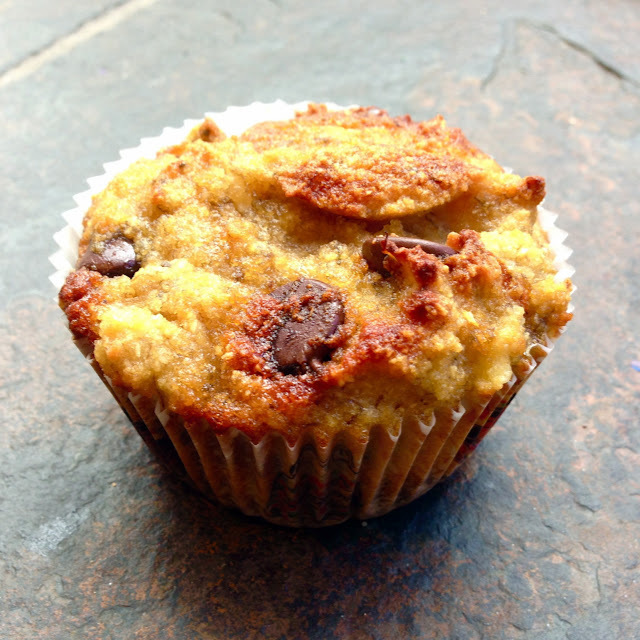 I’ve been adding these gluten-free banana chocolate muffins into the repertoire lately. Now, we all know that I’ve got nothing against gluten, being that I bake my own bread. But these are so easy to make, don’t require a ton of ingredients, and they always, always come out moist. We’ve made a little video below, with the full recipe under the video. Hope you enjoy these — cheers! Preheat the oven to 350F and line a standard muffin tin with 12 baking cups. In a large mixing bowl, combine the all ingredients except for chocolate chips. Use a spatula to mix well; then fold in the chocolate chips. Divide the batter among the 12 cups, then bake at 350F for 23-25 minutes, until the edges are golden the centers of the muffins feel firm to a light touch. Allow the muffins to cool for at least 20 minutes before serving. Store these in the fridge if not eating immediately. The world is awash today with images of hearts and chocolate. Happy Valentine’s Day, friends. I know what you’re thinking. Chocolate, hearts, berries…but what’s Valentine’s Day without quinoa? I hear you, ye tired, hungry and gluten-free. Because having quinoa in your cake is like having dinner together with dessert. It’s just more efficient. Bake it like she tells you to. I’m sorry, but making my hair look effortlessly tousled has drained me of my will to share detail. You’ll end up with a cake. So follow the recipe. Eat it. Enjoy.